Four percent of Washington secondary-school students have non-medical vaccine exemptions. In Oregon, which has a similar law, 7.5 percent of kindergarteners in 2018 were missing shots for non-medical reasons. A common reason cited by those who don’t want their kids immunized is the belief that vaccines cause autism, though many studies have shown it does not. 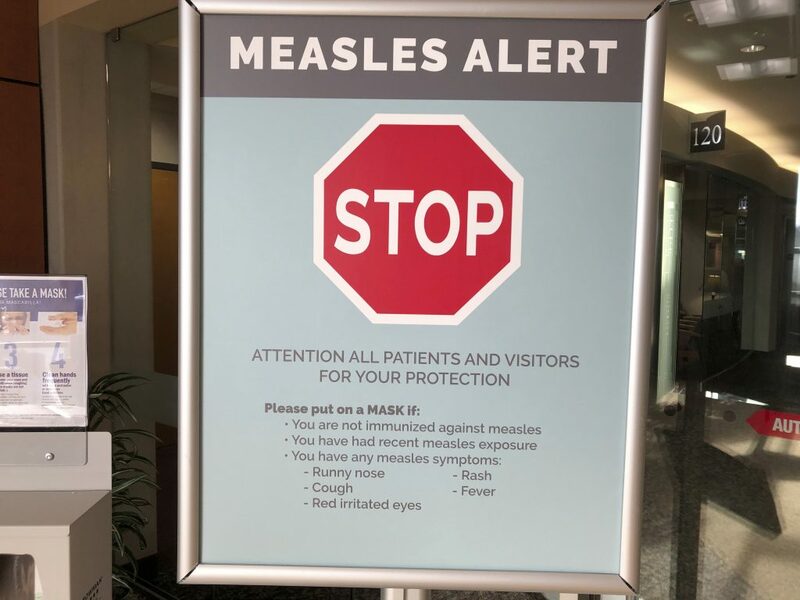 Those opposed to certain vaccines also object to an outside authority mandating what they put in their children’s bodies, and some have concerns about the combination of the measles vaccine with the mumps and rubella immunizations, which is how it’s routinely given. Oregon has the nation’s highest statewide vaccine-exemption rates, and some communities have rates that are even higher. Washington’s exemption rate, although lower, is also high when compared with other states. Nationwide, the median exemption rate for at least one vaccine for children entering kindergarten in the 2017-2018 year was just over 2 percent. In Washington state, legislation that would have removed the personal- or philosophical-belief allowance never made it to the House floor for a vote in 2015 amid stiff opposition. California is one of the few states that stripped away personal-belief vaccine exemptions for children in both public and private schools. The law passed in 2015 after a measles outbreak at Disneyland sickened 147 people and spread across the U.S. and into Canada. It occurred despite an earlier law that required parents to talk to a doctor to opt out of vaccines. Vermont also abandoned its personal exemption in 2015. Before mass vaccination, 400 to 500 people in the U.S. died of the measles every year. Rare but serious complications include brain swelling that can cause blindness or deafness and pneumonia.